Not one but two Canadian women have a chance to break Rachel Cliff’s 1:10:08 Canadian half-marathon record this month or next, including Cliff herself, who will race the Marugame Half-Marathon in Japan on February 3. However, Canadian 10,000m record-holder Natasha Wodak could challenge it this Sunday at the Houston Half-Marathon. Cliff, who is also the current Canadian 10,000m and 10K road champion, set the half-marathon record last March at the Woodlands Half Marathon in Texas, breaking Lanni Marchant’s previous record of 1:10:47. Marchant still holds the Canadian women’s record in the marathon (2:28:00). Wodak’s personal best in the half is 1:11:20, only a minute off the record. Though she hasn’t said she’s going for the record, she reports feeling fit and ready for Sunday’s race, which will also feature Canadians Dayna Pidhoresky, Canadian marathon champion Kinsey Middleton, Canadian W40 marathon record-holder Lyndsay Tessier and Canadian W45 marathon record-holder Catherine Watkins. 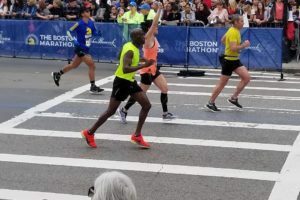 Cliff had an astonishing year in 2018, debuting the marathon at Berlin in September with an incredible 2:28:53, less than a minute off Marchant’s record. Both Cliff and Wodak live and train in Vancouver.